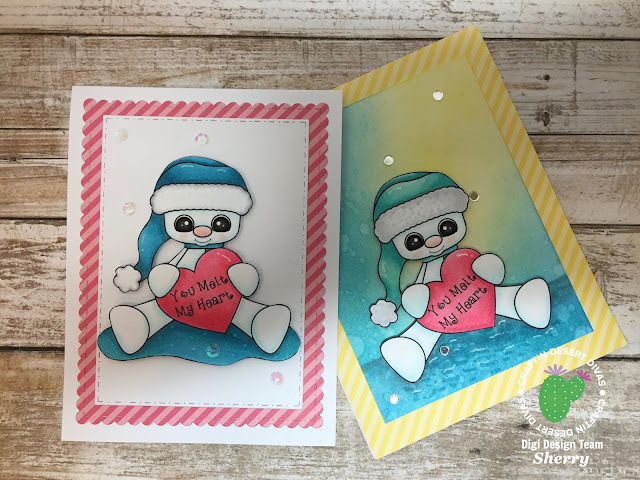 Today I'm sharing two cards that I made using the Craftin Desert Divas, "You Melt My Heart Snowman" digital image. For the card on the left, I also used the CDD "Fancy Frame" dies and I used Bubblegum and Shimmer sequins to embellish both cards. I used Lawn Fawn "Let's Polka in the Meadow" 6 x 6 paper pack to mat both cards. The image was printed twice onto Neenah Solar White card stock. I drew in the puddle of water for the card on the left, but left the right one as is. I colored both with comic markers, then cut them out. The background for the card on the right was done by sponging on distress ink and I darkened up the bottom by using a few cool gray Copic markers. I added a little white gel pen detail to both, then popped them up on foam tape.